Turkey’s approach to new nuclear involves a role for the Turkish Government in facilitating nuclear power projects in Turkey that will be built, owned, and operated by foreign companies. The Turkey Build-Own-Operate (BOO) approach is similar to the merchant nuclear project approach in the UK (e.g., Hinkley Point C). The Turkish approach involves power purchase agreements for the nuclear projects that cover a portion of the nuclear project output and for a portion of the nuclear project’s operating life, with the nuclear project owner obtaining additional revenue in the Turkish electricity markets. 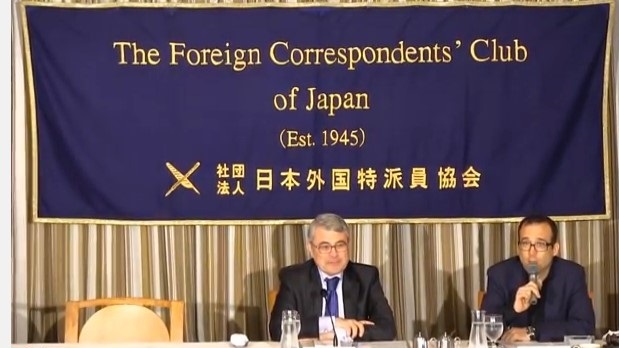 Tom O’Sullivan reports on a talk in Tokyo last week by the Turkish Ambassador to Japan that explains the Turkish need for nuclear electricity. Yesterday some colleagues and I had the privilege of spending time with the Turkish Ambassador to Japan, Ambassador Ahmet Bülent Meric, at the FCCJ. As Turkey has become one of the world’s most critical transit country for energy supplies, the opportunity was very welcome and timely. Ambassador Meric provided an update on the geopolitical situation in the Middle East and fortunately also spent much of his discussion on Turkey’s energy situation and the pivotal role that Turkey’s plays as a conduit country for oil and gas supplies into the Mediterranean and into Europe. The Ambassador had previously served in Israel, Iran, and Ukraine before taking up his position in Tokyo. Bahrain’s Ambassador to Japan was also present yesterday and contributed to the discussions. Turkey has a nominal GDP of one fifth of Japan’s, nominal per capita GDP of $11,000 (about one third of Japan’s GDP), and annual trade flows between Japan and Turkey are about $4 billion so are relatively modest. Turkey is a member of NATO. Japan has also provided about $4 billion of cumulative loan and grant assistance to Turkey. Turkey’s energy consumption is about 800 thousand barrels per day of oil (about 1/4 of Japan’s oil consumption), 45 billion cubic meters (BCM) per year of natural gas (about 40% of Japan’s natural gas consumption), and about 100 million tons per year of coal (about 50% of Japanese coal consumption). These are some of my [Tom O’Sullivan’s] quick takeaways with regard to Turkish energy developments which may not necessarily reflect the views of the Ambassador. This has been a critical week for Turkey for three reasons. The P5 + Germany countries have just concluded overnight a nuclear and sanctions agreement with Iran. Turkey shares a 500km border with Iran and Iran is one of Turkey’s major energy suppliers for oil and gas. This agreement may gradually phase out EU, US, and UN financial and energy sanctions against Iran. Brent oil prices are down $2 a barrel already this morning. Turkey has just suffered its worst power outage in decades this week with all provinces impacted with the exception of those bordering Iran. The Turkish parliament has approved this week the construction of four Japanese-French nuclear reactors on the Black Sea at a cost of about $20 billion. Russia will construct another four reactors on the Mediterranean at a cost of $20 billion. This will move Turkey into a #2 position behind China in terms of new nuclear build. Turkey is positioned in one of most difficult geopolitical geographies in the world at present with eastern borders with Syria, Iraq, Iran, Armenia, Azerbaijan, Georgia and western borders with Bulgaria and Greece. The population of the Middle East (excluding the Maghreb) is 371 million and has increased by 61% from 1990 to 2010, one of the world’s fastest growing populations. Turkey has 1.7 million Syrian refugees at the moment that so far have cost $5.3 billion with an estimate of 11 million Syrians needing extensive humanitarian assistance. Turkey is energy poor with very modest supplies of domestic oil and gas and most of its coal resources are hard coal. Its two principal energy suppliers are Russia and Iran both of which are currently sanctioned countries. The Turkish goal is to improve and diversify energy security by expanding the number of countries that supply oil and gas, build out civilian nuclear capabilities, and expand its renewable energy portfolios. Like Japan, Turkey is earthquake prone that will pose challenges for construction of nuclear facilities. All of the oil and gas for domestic consumption is imported via pipelines from Russia, Iran, and the Caspian area. The Turkish Straits/Bosphorus transits about 3.5 million barrels per day by tanker from Russia and the Caspian area to Europe and is the fourth most congested shipping transit point after Hormuz, Malacca, and Suez. The Turkish Mediterranean port of Ceyhan continues to be a major transit point for Middle East oil and gas exported to Europe. The Kurdish situation continues to pose significant diplomatic challenges for Turkey. Negotiations on EU membership continue but interest on both sides may be waning and now made more complicated by the Ukrainian/Crimean crisis. Turkey continues to object to the Crimean invasion by Russia. Lower oil prices are welcome to Turkey and may also encourage Middle East exporters to diversify their economies. Borders between Iraq and Syria may need to be more flexible or porous in future to reflect the historic ethnic and religious make-up of the region. This was corrected from earlier amount.